A teenager is sent to a detention camp for youths for a crime that he didn't commit. The camp has an unusual work detail - digging a 5 foot by 5 foot hole every day. $16.300 million on 2331 screens. Without any fanfare, Holes emerged as a decent little sleeper hit in the spring 2003 release season. The movie made only $67 million, which won’t make a dent on the year-end top grossers chart, but for a flick with a $38 million budget and no real star power, that seems more than acceptable. 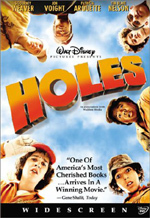 Based on the novel by Louis Sachar, Holes focuses on teenaged Stanley Yelnats IV (Shia LeBeouf). Oddly, he gets hit on the head with a pair of shoes that fall from the sky. 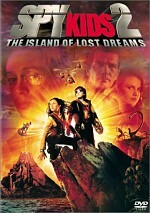 We learn that a curse allegedly affects the Yelnats family caused by Stanley’s great-grandfather. Stanley gets arrested for stealing the shoes – since no one believes the sneakers dropped on him – and ends up at Camp Green Lake to “build character”. When he arrives, he meets Mr. Sir (Jon Voight), a nasty customer who runs the camp on a day-to-day basis. Stanley learns that the kids there must dig on five-foot-by-five-foot hole ever day “to build character”. He also meets Dr. Pendanski (Tim Blake Nelson), the camp’s counselor, and gets his assignment to “D” Tent. There he encounters all his bunkmates: X-Ray (Brenden Jefferson), Squid (Jake M. Smith), Armpit (Byron Cotton), Magnet (Miguel Castro), Zigzag (Max Kasch), and Zero (Khleo Thomas). Initially, all the kids give Stanley a hard time except for quiet little Zero. The voluntarily mute Zero conveys the impression that he possesses low cognitive skills, but he starts to open up to Stanley. Eventually Stanley starts to fit in with the other kids, and after he doesn’t back down from a fight, he earns the nickname “Caveman”. When the kids dig their holes, they have to report any interesting items they find. 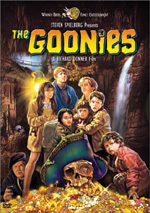 If the warden (Sigourney Weaver) deems them good enough, the kid who locates the piece gets a day off from digging. Stanley discovers a gold tube that excites the warden and accelerates the digging process. Holes frequently launches into flashbacks. Some of these depict the origins of the Yelnats curse with the great-great-grandfather (Damien Luvara) and a mystical character named Madame Zeroni (Eartha Kitt). However, the most important flashbacks go to the 19th century and show a forbidden romance between an interracial couple, Onion Sam (Dule Hill) and Katherine Barlow (Patricia Arquette). We see the fates of these lovers and watch the unlikely course of action one of them takes. Past and present connect as matters in the camp come to a head. The frequent interaction of past and present creates an interesting and unusual element of Holes. The play a more important role than typical and help the film grow and progress. During the early parts of the flick, the flashbacks come across like comic bits that feel more like a gimmick than anything else. However, the romance between Sam and Katherine comes to take a prominent part in the story and helps tie things together at the end. I don’t want to explicitly discuss the movie’s conclusion, but suffice it to say that all of the different threads eventually connect. This seems somewhat artificial but doesn’t create any problems due to the movie’s tone. Holes starts off as a pretty nutty effort, and while it becomes more serious as it progresses, it still keeps a toe in the wacky side of things. The flick never intends for us to view it as part of the real world, honestly. It’s a fable and a fantasy, so while it deals with real life issues, its tone ensures that we can see things in a more magical light. That attitude could have caused some problems, as the supernatural attitude easily could have turned cloying. Happily, it doesn’t, largely due to the down-to-earth performances from the young actors. The cast avoid the usual cutesy pitfalls that befall most performers in their age group. The movie doesn’t wallow in the kids’ problems, as it treats them rather matter-of-factly. The actors create believable personalities within the film’s broad framework and feel real. As our lead, LeBeouf excels. He makes Stanley likable but doesn’t turn him into a caricature. He stands out mostly because of his role’s prominence, but all the kids come across as natural and they fill their parts very nicely. Some elements of Holes seem a little too coincidental, and if you don’t buy into the flick’s magical tone, you’ll find the ending very tough to swallow. However, these elements go down easily as the film creates a generally charming and warm experience. Holes is a family drama that integrates comedy and wackiness fairly naturally, and it comes across like a surprisingly seamless and enjoyable package. Note: fans will want to stick with the movie through the conclusion of its end credits. A small tag appears once the text finishes. Holes appears in an aspect ratio of approximately 1.85:1 on this single-sided, double-layered DVD; the image has been enhanced for 16X9 televisions. The DVD offered a terrific picture that showed virtually no signs of problems. Sharpness looked immaculate. The movie always came across as concise and distinctive. If any signs of softness appeared, I missed them, as I thought the flick seemed well defined. No issues connected to jagged edges or shimmering occurred, and I also noticed no signs of edge enhancement. In addition, the movie didn’t exhibit any print defects, as it consistently looked clean and fresh. Due to the arid setting, Holes often presented a fairly subdued palette, but the film’s hues were still pretty vivid and lively. Since it jumped between settings and eras, we got lots more opportunities for other hues, and these always looked accurate and tight. Black levels were similarly deep and rich, while shadows were clear and appropriately detailed. A few shots featured some slightly opaque “day for night” images. If you want to find real flaws, though, look elsewhere; Holes provided a positive visual presentation. In addition, the Dolby Digital 5.1 soundtrack of Holes seemed very solid piece of work. The movie presented a nicely broad and engaging mix. The music featured fine stereo imaging in the front, and effects also appeared nicely spread and logically placed. The surrounds added a good kick as they reinforced the music and also featured some strong independent material. Those speakers weren’t limited to just reinforcement, and they gave us a good feeling of environment. Audio quality was terrific. Speech always came across as distinct and natural, with no issues connected to edginess or intelligibility. Effects sounded clean and concise, as they presented no distortion or other issues. Music worked best of all. Both the score and the songs were bright and dynamic, and they featured terrific bass response. Low-end worked well across the board, but the music demonstrated the strongest elements in that regard. Overall, the soundtrack nicely complemented the flick and worked very well. Holes includes a decent set of supplements. We start with two audio commentaries. The first comes from director Andrew Davis and author/screenwriter Louis Sachar, both of whom sit together for their running, screen-specific piece. Though generally decent, their chat seems too inconsistent to be anything above average. The pair go over a good variety of topics. They get into changes from the book to the movie, issues related to the flick’s “PG” rating, locations, effects, logistical challenges and other concerns. Unfortunately, a fair amount of dead time occurs. The gaps aren’t large, but enough of them happen to add up to a lot of empty space. This causes the commentary to drag and means that it never turns into something special. For the second commentary, we get remarks from actors Shia LeBeouf, Khleo Thomas, Jake M. Smith and Max Kasch. All four of them sit together for their own running, screen-specific piece. Can one expect a lot from a commentary that features four teenage guys? Apparently not, as the result seems loose and generally uninformative. The kids occasionally toss out an interesting anecdote or factoid, but mostly they just exclaim their appreciation for the movie or its women and rag on each other. While I didn’t enjoy this track, I don’t want to sound too nasty about it. As with Amanda Bynes’ commentary for What A Girl Wants, it’s simply not sensible to expect a tight and coherent discussion of a flick from teenagers. Actually, it might be a little freaky to hear kids sound like little Eberts. The guys here act their ages, and that’s not a bad thing. However, it doesn’t make this track very interesting, at least not for anyone over 15. A featurette called The Boys of D-Tent lasts 10 minutes, 40 seconds. It mixes movie clips, shots from the set with soundbites from director Davis, producer Teresa Tucker-Davies, production designer Maher Ahmad, head animal trainer Larry Madrid, and actors Miguel Castro, Jake M. Smith, Brenden Jefferson, Shia LeBeouf, Max Kasch, Byron Cotton, Khleo Thomas, Jon Voight, Sigourney Weaver and Tim Blake Nelson. Despite the brevity of the program, it tosses in some good elements. We get looks at audition tapes and get a feel for how the actors came to their roles. We see a little about the lizards used for the flick and learn about various production challenges. The show lacks depth but it seems reasonably informative. Another featurette shows up next. Digging the First Hole fills nine minutes, seven seconds and uses the same format as the prior piece. We hear remarks from Davis, actors Voight, Weaver, and LeBeouf, writer Louis Sachar, and producer Mike Medavoy. We get some information about how Sachar came to write the book and how it moved to the big screen. A few other general bits appear as well, but those subjects dominate. Unfortunately, the program often feels like little more than an excuse for all involved to praise each other. It includes some good notes but it suffers from too gushy a tone. Within the Deleted Scenes domain we find six unused segments. These run a total of six minutes, 39 seconds, and mostly feature slightly extended versions of existing scenes. Because of that, none of them seem revelatory, but they offer some useful exposition and come across as generally enjoyable. More superfluous footage shows up in the gag reel. This 102-second compilation provides some uninteresting goofiness from the set. In an unusual twist, though, it also tosses in outtakes from the DVD interview sessions, though these remain dull as well. We also find a music video for “Dig It” by the D-Tent Boys. It lasts a mere 62 seconds and is nothing more than movie clips intercut with shots of the kids as they record the song. Yawn! As the DVD starts, we encounter a mix of ads. We find trailers for George of the Jungle 2, The Lion King, Brother Bear, and Finding Nemo. These also appear in the disc’s Sneak Peeks domain along with promos for Santa Clause 2 and Freaky Friday. Finally, we find the THX Optimizer. It purports to help you set up your home theater to best present the movie on the disc in question. Apparently the Optimizer is unique for each DVD on which it’s included; unlike programs such as Video Essentials, the Optimizer should tweak your set-up differently every time. Frankly, I’ve been very happy with my already-established calibration and I’m afraid to muck with it, so I’ve never tried the Optimizer. If you lack calibration from Video Essentials or a similar program, or if you’re just more adventurous than I, the Optimizer could be a helpful addition. A real sleeper, Holes came out of nowhere and made a moderate mark on audiences. It deserved to do well, as the movie presents a fairly charming and creative family flick. The DVD offers excellent picture and sound plus a better than average set of supplements. This one works for kids and adults and comes with my recommendation.